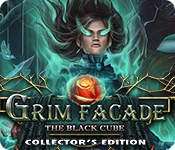 Grim Facade: The Black Cube Collector's Edition is rated 2.7 out of 5 by 15. Rated 5 out of 5 by biscuitsmama from WHAT IS SO SPECIAL ABOUT THE BLACK CUBE AND WHY DOES IT CAUSE SO MUCH TROUBLE? Grim Façade is another of those series that seems to never end and honestly, I was quite prepared to not even play the demo of the game let alone purchase it. However in another surprise for me, AMAX has created a Grim Façade that I actually like and have enjoyed playing. Perhaps it is because some recent games from developers have made it difficult to find one or more hidden items before we can make initial progress in a game. I really like the fact that in the Black Cube I didn’t need to scratch my head to figure out where to begin and since it was evident that we needed to figure it out quickly; I found it easy to at least begin the game. I’ve stopped writing reviews where I will give away the storyline and itemize every little detail as I believe that gamers are very smart and truly want to figure it out for themselves. After all, IMHO, discovery is half the fun of playing a game. If you want more information before you try the game there are a few reviewers here who write very comprehensive detailed reviews to provide that information for you. Although the storyline might seem confusing, I found it to be interesting and it kept me playing the game. I loved the graphics because AMAX creates such realistic characters in its games. I enjoyed the HOPS that I found to be well designed even though some items might have been difficult to find. The puzzles were terrific and although they were not difficult they were entertaining and fit well with the gameplay. 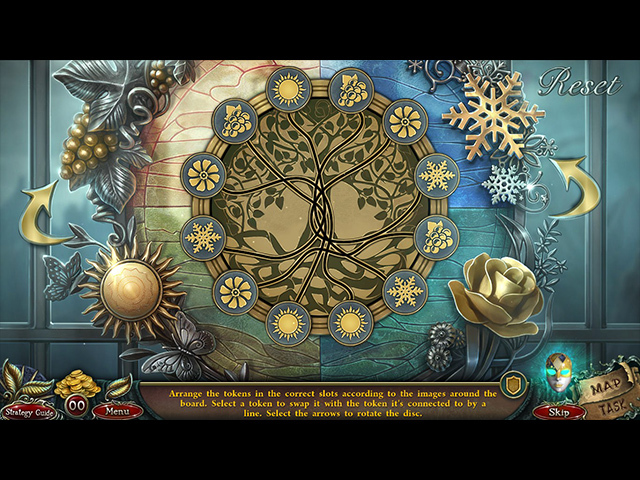 I often become weary of a game when there are far too many puzzles that make it seem like we are never moving forward. Not so with the Black Cube, because I enjoyed the puzzles that included some I haven’t seen in a while and others that are my favorite types in a game. The CE content is what we generally expect to find but I appreciate being able to replay the HOPS and Puzzles. I wish all developers would provide that option since if I happen to skip one while playing, I have the option to replay it in the extras. All in all, Grim Façade the Black Cube is a good game and one that I found entertaining. Not everyone will agree but at least for me it is one of the better games I have played this year. Although this game is one that I love I always recommend that you try the demo to see if it is one you will enjoy also. Happy gaming! Rated 5 out of 5 by heartblob from its getting grimmer !!!! excellent game, graphics are excellent , music is lovely , so much to do , look for morphing roses, and more, hos are very good and interactive , a very enjoyable game as with all the Grim Façade.... look out for the baddies, they are ruthless . Rated 4 out of 5 by sunnyglow from BEWARE A “PLAGUE” OF BEHIND-THE-SCENES ANIMAL SERENADES REVIEW BASED ON THE ENTIRE GAME: 4 Chapters Plus a Bonus Chapter - Strategy Guide: 44 Pages OVERVIEW: Detective! You are off to a small village during the Carnival of the Black Cube. The Black Cube seemingly protects the village from an ancient evil. You have been contacted by David Campari, a collector of amulets and artifacts. Now that he has purchased the Black Cube, he feels he and his wife, Allegra, are in danger. His greatest fear is realized when masked thieves attempt to steal it but are thwarted. Unfortunately, during the skirmish, the seal is broken on the cube and an evil entity, the Chosen One, escapes possessing the body of Allegra. Now a group of villagers, the Children of the Dawn want to burn her in a sacrificial offering and place her ashes within this cube to placate Plague, a destructive monster who brings sickness in his wake. A deal has been made; this evil entity wants her soul before dawn! Can you save Allegra and stop the sacrifice? OPINION: This is a decent, but not outstanding game. It should appeal to those who like this series. I have mixed feelings about this game. I found the storyline confusing and the story seems to change throughout the game. For me, it was difficult assessing who all the evildoers are in this game. I am still trying to ascertain who the “Master” is. To me, it is a mismatched hodgepodge of ever-changing storylines stitched together with a host of evildoers. Nevertheless, the graphics are beautiful as usual. I do like the activities within this game. 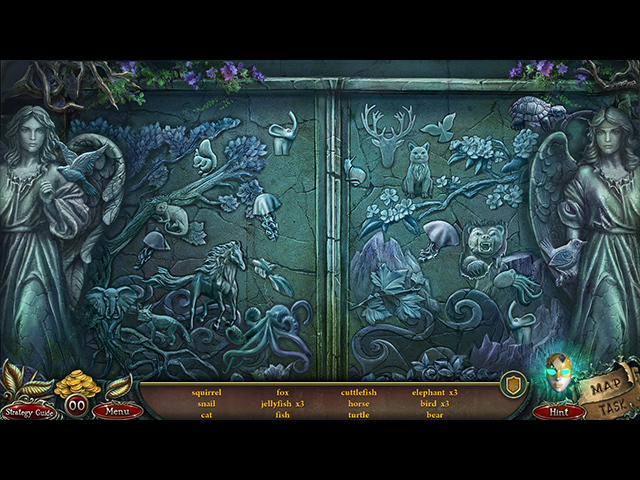 There are some creatively designed HOP scenes and puzzles. I do wish, however, that AMAX would get rid of the howling wolves, barking dogs, and screeching cats. I found the animal sounds distracting and annoying. The background noises spoiled the game for me. MECHANICS: There are the usual four (4) levels of play including a customized version. Collect twelve (12) amulets. You will be given history concerning these amulets within the “room” in which they are kept. Collect coins to purchase items used in the game. There are eighteen (18) morphing objects (roses) to collect. You can replay thirteen (13) puzzles and sixteen (16) HOP scenes. There are eight (8) wallpapers along with concept art, music and video cutscenes. BONUS CHAPTER: It is s sequel. A peddler from the main game has contacted you. He sold amulets promising riches and success to those who purchased them. However, shortly after possessing them, those who purchased them became wooden statues. David Campari designed them; however, the power source for the amulets is for you to discover. It is a long chapter, well-worth the extra money for the collector’s edition. There are eleven (11) puzzles and seven (7) HOP scenes. There are no collectibles within this chapter. HOP SCENES: There are seventeen (17) HOP scenes within the game. There are also several mini-HOP scenes within the bonus chapter in which the player searches for a small number of items. There are the usual lists of items, silhouette items, and storybook scenes with items to be found listed in highlighted letters. There is a replacement scene in which the player must place items in the proper location. There is also a “find the differences” scene in the bonus chapter. There are a few multiple-step ones in which the scenes change from one form of HOP genre to another. FAVORITE HOP SCENE: There is one HOP scene which I found very creative. It is a scene with a large rock with symbols upon it. You must remove the symbols with a pickaxe. You are given symbols at the bottom of the screen and must choose the two symbols on this rock, which, when combined, produce the given symbol. PUZZLES: There are thirty-three (33) puzzles within this game. The puzzles are excellent! For me, this was the best part of the game. 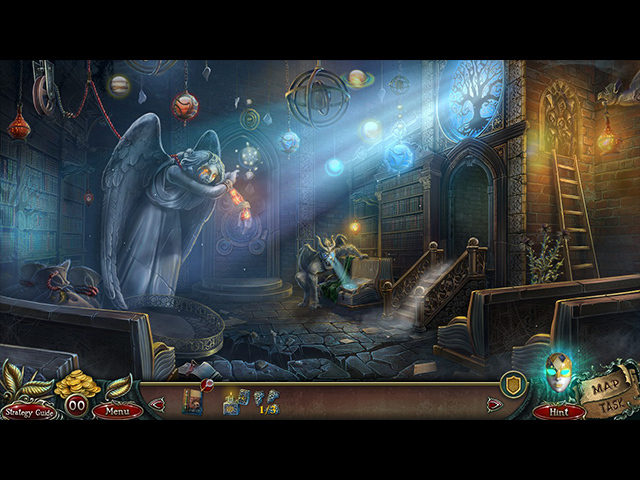 There is a wide variety of puzzles which vary in difficulty as well. There are three puzzles in which you can choose between playing them in a “casual” or “hard” mode. SPOILERS: HERE ARE SOME OF THE PUZZLES AFTER THE DEMO: A. Sequence puzzle. On a skull with letters written upon the top of it, light up only the letters than spell “PAIN.” Lighting up one letter lights up others as well. B. Alignment puzzle. On a rock with an image etched into it, move and rotate four projections (shadows) so that the projections match up with the image on the rock. Use arrows to rotate the projections as well as sliders to move them. There are also “plus” and “minus” buttons to increase and decrease their size. C. Map/Sequence puzzle. Plot a path to move your horse through town to an excavation site by placing six (6) markers in proper sequence. Then, press Start. If chosen in the proper sequence, the horse will arrive at the designated location. Do not land on obstacles or you start over. D. Assembly puzzle. Slide four cutters on a lathe to cut six (6) boards as per given instructions. E. Jigsaw puzzle. Create a bridge! Now take those boards and place them into proper position so they interlink to create a bridge. F. BONUS CHAPTER: Switch puzzle. Switch halves of a series of lock tumblers so they mesh together. Press on “check” to see if they align correctly. G. BONUS CHAPTER: Assembly puzzle. Rotate sections of a path in a grid to create a path for a key to move from the top to a keyhole at the bottom. Rated 3 out of 5 by cathybobcat from SHORT AND FORGETTABLE The best part of this is the graphics which are always atmospheric and inviting in this series. That is as far as it goes and not a game I will want to play again. It was also too short and repeated scenes too frequently. I have all of these, some CE and others SE, and think this one is the most lacking of all. The story was confusing, particularly the end. Huh??? You can replay 16 HOS and 13 Puzzles. There are many more puzzles in this than that, so you get to replay what they give you. As usual there are always more puzzles than HOS which I would like it to be the other way around.....wishful thinking. The collectibles are not outstanding....only 12 amulets and 18 morphs, which there are indicators for. Although the Extras section is attractive, there is nothing of interest that I found. There are 12 Achievements which is a very pretty wreath....18 movie scenes....8 wallpapers...12 concept art...4 music tracks....and a not so attractive room where your collectible amulets go that contain info...and where David looks like he is hung over. The Bonus Chapter is what did me in with repeated scenes from the main game...only one or two new ones. It is utterly loaded with puzzles, and only a few hos which only one was done well to me. If you chore through these annoying puzzles it only makes the game seem longer than it actually is, which I think is the reason for incorporating them into a game. I do not care to be spending time with them. It is not balanced or enjoyable. The main game is sufficient without this garbage or an empty story, so the SE would be quite sufficient. P.S. I really miss Felix. It isn't the same without him. Bring him back. Rated 3 out of 5 by Granny_Gruff from Amulet Or Curse? David Campari collects protective amulets for his small museum. His wife, oddly named Allegra after a popular medication, is a historian who helps him in his work. At this time David has called for your help as he has finally gotten possession of the Black Cube. He fears they are in danger. Before you can hear the story from the couple, they are pulled inside the museum with the Black Cube and you are left locked outside. You are in for a wild ride, detective. Good stuff: Lots of the usual game elements and CE bling fill out a muddled story. The artwork is well done, but the VOs are uneven - some on point and well-done, others bland and spoken in a monotone. Bad stuff: If the story was clearer it would help the game along. Perhaps the Dev obsessed with his seasonal allergy medication should have been clearer in his story presentation. Bottom line: Play the demo. See if you like the game elements enough to see past the problems. I wasn't impressed with the level of average. Rated 3 out of 5 by Lime_Cordial from Great graphics but too many cut scenes This will appeal to gamers who love cut scenes. I was bothered by the constant long dialogue and cut scenes so not for me. Great graphics though and voices. Rated 2 out of 5 by henryhaynes from Talk about a Grim Facade! Amax Interactive has released a new addition to the section of their HOPA games that make you think "What on earth was that?!" The free trial is exciting and shall make you want to play on, but I advise you don't. The storyline (if you can call it that) is minute and convoluted, keeping you in a permanent state of confusion, and also featuring a very convenienl loophole(poorly explained in a story HOP) which will help you complete your super objective, one of the main signs of poor writing. Another issue I have is the length of the game. Looking at the strategy guide table of contents tells you a lot about the game and where abouts you are. The game consists of 3 chapters. 3! It only took me about an hour to complete the full game, and it was very easy for me to zap from scene to scene with my practically empty map. The main game was short and the bonus chapter ( also featuring a poor unoriginal storyline) was even shorter . I feel like the developers could have added more to the game, or maybe made it somehow less generic. I don't normally drag games through the mud but Oh Asmodai I regret this purchase! Rated 2 out of 5 by linda072 from Cut scenes galore! Personally I always click through the cut scenes as I find them distracting. I spent more time clicking through them on this game than I actually spent playing the game. Did not like. Did not buy!